There really is no stopping Edie Rodriguez and Crystal Cruises. 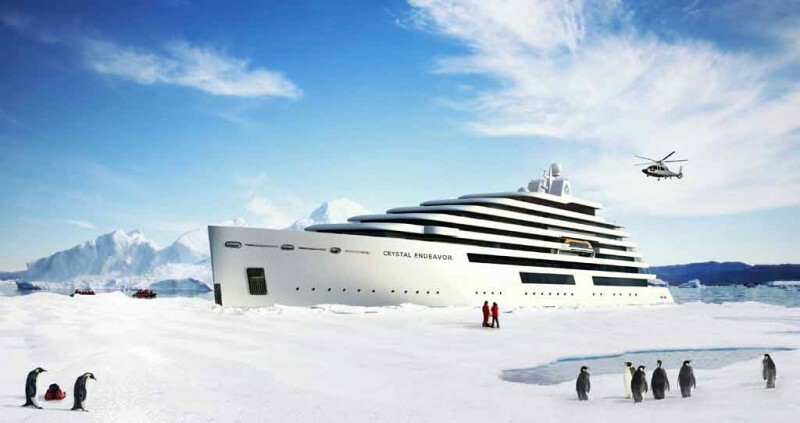 Just months after the successful launch of Crystal Yacht Cruises’ 62-guest Crystal Esprit, the “World’s Most Awarded Luxury Cruise Line” has announced it will build a Polar class megayacht. 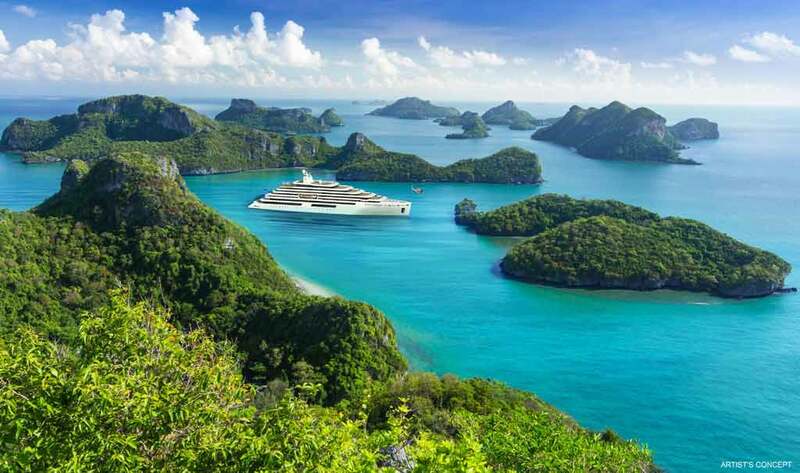 Measuring 600 feet (183 meters) long and carrying 200 passengers, the 25,000 gross ton new build Crystal Endeavor will be the largest and most spacious megayacht afloat. Construction begins in May and the ship will carry its first passengers in August 2018. Endeavor will be the first purpose-built Polar Code compliant yacht in the world with a PC6 Polar Class designation, allowing it to cruise in Polar regions during the summer and autumn. She will be fitted with the state-of-the-art offshore dynamic positioning technology – computer-controlled systems to maintain the ship’s position automatically with its own propellers and thrusters. This will enable the megayacht to ‘hover’ over coral reefs and other underwater wonders without the need for anchors. Endeavor will cruise in the Artic; then follow the route of migrating whales along the coast of the Americas and Europe to Antarctica during the winter. Along the way, she will visit remote islands in the Atlantic and the Pacific Oceans, which cruise ships seldom call or cannot access. With a Remote Operated Vehicle, expedition cruises will also be organized to see sunken galleons, warships and passenger ships, such as the Titanic at 12,500 feet. The 100-suite Endeavor will offer extreme adventures by air, sea and land with a complete range of “toys” including two helicopters and two landing pads for flightseeing expeditions, as well as two, 7-person submarines, eight electric amphibious zodiacs, jet skis, wave runners, kayaks, fishing facilities, paddle boards, snorkeling and scuba equipment, recompression chamber, dive support tender and a multi-person ATV . The standard guest suites will measure a minimum 400 square feet (including balcony), larger than all current expedition and luxury cruise ships, while the yacht’s two Owner Suites’ will each boast a whopping 3,122 square feet (1,615ft2 interior and 1,507ft2 balcony), making them the largest guest suites of any megayacht afloat. Crowning the yacht will be Crystal’s signature Palm Court, which will offer 270-degree panoramic views for whale-watching and viewing other wildlife. Endeavor will have a combined Spa and Conservatory space of 10,000 square feet, featuring a full-service Spa, Yoga, Pilates, Salon and Wellness Center; Jacuzzis; and an infinity pool whose base can be lifted to be a dance floor or an alfresco dining area. The megayacht will also feature six dining options, a 200-seat theatre, numerous lecture rooms, cinema, card room, and a computer center. Also introduced at last night’s event in Fort Lauderdale was Crystal Luxury Air’s third jet – a Bombardier Global Express configured to carry 12 passengers. It will be available for private charter from $8,000 per hour. JUST ONE small point for Edie and Crystal to bear in mind. If the new megayacht is being named after the ship that took Captain James Cook to Australia, it should be called Endeavour rather than Endeavor.